Now is the time to prepare your greenhouse for the upcoming fall and winter seasons. In this issue, we'll give you things that need to be done in the greenhouse in September, as well as creating a heat sink and preparing your greenhouse for the fall and winter. With outdoor gardening during the summer, greenhousese are less crowded. 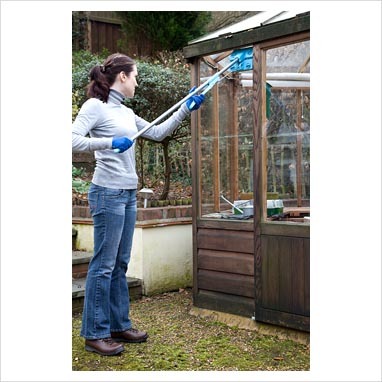 September is the perfect month to clean and organize your greenhouse before plants are moved inside for the winter. Begin by emptying the greenhouse and discarding tired dying plants. Wash down the entire greenhouse including all sides and the roof. Wipe all shelving and benches clean. If you used shading paint for the summer, wash it off as well. Sort out your supply of containers and assess whether there is anything that you need to purchase in addition to what you already have on hand. Replenish any supplies needed for the winter season such as seed bed warmer pads, heaters, etc. Be sure your heaters are working and check all electrical outlets. When you feel confident that the greenhouse is ready for another season, you can reorganize your plants in the greenhouse. Be sure to bring sensitive plants into the greenhouse before the first frost. Take the final cuttings and water dormant houseplants to revitalize them. Collect and sow seed from perennials and some of the stronger, robust annuals. Now is the time to pick the remaining tomatoes from your garden that are still green and lay them in a sunny area of your greenhouse for ripening. Putting your outdoor garden to rest for the winter, the greenhouse will conveniently protect your plants from the elements. With all of your greenhouse cleaning and maintenance work done, you can enjoy planning the design of your outdoor garden for the next season. Utilizing the heat and solar energy that exists during the daytime hours can be conserved with the use of a heat sink. This will help reduce your heating costs during the colder winter months. There are various designs for a heat sink that can be personally constructed, but the most common model is a dugout below the floor surface of the greenhouse. The dugout is filled with absorbing materials that soak up the heat from the sun. When the colder night air falls, the heat from this dugout (heat sink) rises and warms the room. The hole that you dig should be ast least 3 to 4 feet wide as well as deep. Insulate the hole using polystyrene and foil and other materials that allow air to pass while storing heat. Examples are crushed glass, pea gravel, small pieces of metal and fire bricks. Sometimes painting these materials black can increase the efficiency of absorbing heat. 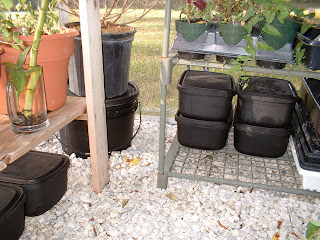 Depending on the size of your greenhouse, a dugout may not be possible. Another simple method of creating a heat sink is to use a black container with a lid, fill it with water and place it a couple of inches away from a wall in the sunniest area of your greenhouse. Large drums painted black are also popular for larger sized greenhouses because the more space to heat, the larger the heat sink is required to be in order to do its job. During the day the drum will absorb the heat and expel it when the temperatures cool, warming the greenhouse. Time is passing quickly and the seasons are changing. It's time to prepare your greenhouse for the cold weather. If your greenhouse does not have a heating system and you close it during the winter months, it will need to be thoroughly cleaned and minor repairs should be made in preparation of the following spring. To begin preparing for the winter months, the following should be used as a guideline. Remove any plants that are seasonal and will not last in the cooler temperatures of a winter greenhouse. Make sure that they are not diseased and use them for composting. Pick up stray leaves off the floor, discard empty bags, use any chipped or broken pots to make a heat sink. Declutter and organize your tools and small pieces of equipment. Sweep the floor, then give it a good washing with soapy water. Hose the floor down to eliminate any soap residue or left over soil particles. Wash the glazing down with mild soap and water. You will want to allow as much sunlight as possible into the greenhouse. Inspect the actual structure. Check the glazing to ensure there are no cracks or spaces. Inspect insulation for any gaps that may have developed. Add extra insulation, especially to the North wall. Use bubble wrap to wrap walls on the interior of the greenhouse. Check your exhaust fans, vents and ducts. Drain your water lines and cover outside faucets with insulation. Before bringing plants in for the winter, be sure they are completely pest free. Run the hose through the plant for a good 5 minutes to drain the soil of any unwanted pests. Spray the plant with a bug spray, then enclose in a large plastic garbage bag for a couple of days. That will rid the leaves of any pests.